On Friday, October 23rd I went to the clinic. I usually shy away from white walls and doctors, but I had back pain so severe the previous weekend that it hurt to stand up straight. I had a fever and was profusely sweating in class, even more than I usually do just standing still in B’quilla heat. I had a full body rash for a few days that I originally though was an allergic reaction (sigh, if only…). I had even passed out in the English lab as I waited for my students to show up to class, which they, uhm, didn’t…thankfully #SENA. Something was wrong, so there I was, falling asleep in the waiting room of a clinic. I was called two hours later. The doctor took one look at me, asked me about my symptoms, and immediately told me I had Chikungunya. Definitivamente tiene Chikungunya. My heart sank as she listed off what I needed to do: take Acetaminophen, rest and drink lots of fluids. And then, I left. I felt crushed. This was the mosquito virus they warned us about on the coast, the one that can affect you for…ever. And all I could do was lay in bed and frame my “incapacitated” days around six hour pill-popping intervals. I slumped up the stairs to my apartment exhausted to find my roommate jokingly calling me “Chikunbaylor.” I had to hand it to him; it was clever. My sense of humor wasn’t what it usually was, but it was pretty damn funny even if tears were welling up in my eyes. And then it dawned on me: They didn’t give me a blood test. Commence Chikunbaylor running around to several clinics to demand a blood test. I had to know for sure, especially when I could have recurring muscle and joint pain. I tired myself out going from clinic to Nueva EPS (Colombian national insurance) office to another Nueva EPS office to attempt to make a doctor’s appointment to no avail. I gave up on the national insurance route and decided to give my international insurance a go. I paid out of pocket for a ‘gunya blood test that cost more than my monthly rent. I was in the do-I-have-it-or-not phase waiting for the test results. And it crossed my mind that there was the possibility that it wasn’t Chikungunya, and that I had only paid for a Chikungunya blood test. I learned a whole damn lot throughout this clinical process. For starters, plan for a day at the clinic — you know, bring food and entertainment. In hindsight, I should’ve been given a blood test during my first clinic visit even if my exhausted, rash-covered self had to wait longer. Apparently, I either had to be hospitalized or make an external medical appointment to get a blood test (another sigh). Acetaminophen can only do so much. My students laughed at me when I told them I got the ‘gunya — they thought that was last year’s disease. I returned to classes after my blood test. I survived Monday to Wednesday despite waking up with intense back pain on Wednesday morning. Wednesday night, I was in so much pain that tears were streaming down my face. I was covered in as many blankets, well sheets, that I had, shivering cold in 85-degree Caribbean weather. Thankfully — again, #SENA — my Thursday classes were cancelled due to teacher training. I stayed in bed all day, soaking my sheets in sweat without any desire to eat. (TMI?). When Friday morning came, my fever had gone down and I was moving around. Pain was still evident, but I felt a hell of a lot better than I did the previous day. I felt unsure about my health, especially after a second wave of pain much more intense than the first round. On Friday, November 13th (opportune date, right? ), I logged on to my online clinic portal to read that my results were negative: I didn’t have Chikungunya. What?! What the hell do I have then?! My roommate rescinded my Chikunbaylor nickname, of course, and told me I’d get better. I began dialing my mom to express the new medical wall I had hit and to ask what I should do next. No answer. That’s weird. Well, I popped more pain pills and packed my bag for Cartagena’s Fiestas de Independencia with much positive reinforcement from my roommate. Breathing in deep, laughing and sneezing sparked instant, specifically-located pain in my lower back, and I made it to Cartagena feeling less than my outgoing, positive self. My roommate and I were meeting our friends at our usual gelato shop, naturally. We were sampling flavors and trying to make the oh-so-hard decision when I noticed that my mom was literally walking up to me in Cartagena. A crying, bent over in pain, but very, very happy Chikunbaylor. Man, I had absolutely no idea. And then my mom showed me a photo on her phone, asking if I had seen it. It was a globe sitting on a desk with a post-it note in my cousin Lisa’s handwriting. It said “Out of Office: November 13th-17th.” I repeated the words out of office slowly, looked up at my mom asking about Lisa, and turned to see Lisa in the flesh in Colombia. Man, I couldn’t handle it. I was practically hyperventilating, taking short breaths to lessen the pain, and literally freaking out. I was in shock, and it was such a relief to see them. So, what did we do? Well, first we got gelato…duh! Then, we went to the clinic to get more tests done. I couldn’t avoid the pain anymore, especially in front of my own mother y’know. I didn’t take my mom and cousin to a regular Colombian clinic to spare them that authentic experience. Instead, I paid out of pocket to get a blood test for Zika and Dengue as well as a check up. The doctor gave me a prescription for antibiotics, pain pills and vitamins, but I had to return tomorrow morning when the lab was open for blood tests. The clinic escapade continued on Saturday as I was poked in several spots to draw blood. 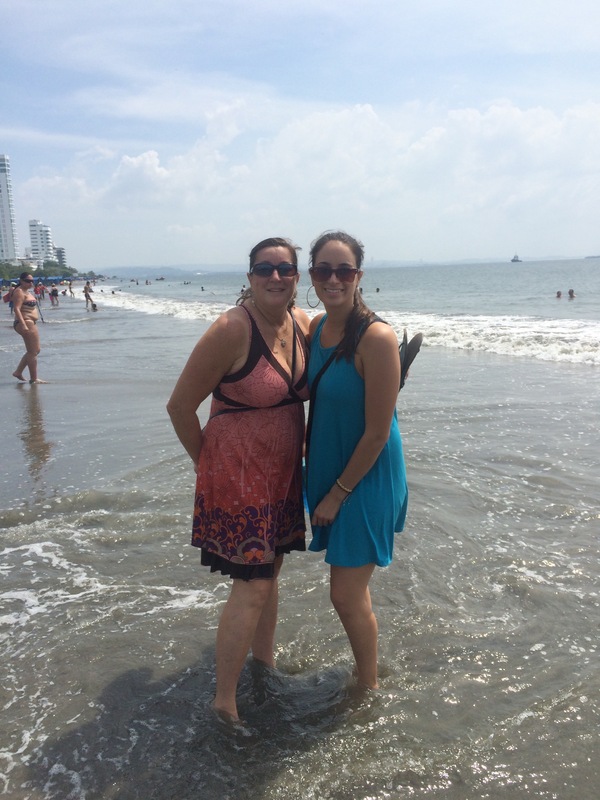 We walked the beach in Bocagrande waiting for the results, and I was again relieved that my mom and cousin were so positive and willing to endure this health roller coaster with me in Cartagena. I found out that I had Dengue, a different mosquito virus with basically the same symptoms as Chikungunya sans the lifelong agony. Finally, a freaking answer! It was reassuring to finally get an answer after about a month of Chikungunya/Dengue insanity. I’m feeling a lot better, and seeing my mom and my cousin had everything to do with that (plus, you know, the pain pills). They completed the Dengue Tour — as Lisa appropriately named it— of the Caribbean coast of Colombia and actually enjoyed it. We were together, I had my appetite back, and, I mean, there’s nothing like seeing your momma when you’ve been the sickest you’ve ever been in your life, no less in a foreign country. And you best believe she brought even more mosquito repellent for good measure. So glad to hear you’re feeling better! Nothin’ like a little Mommacare to help you recover. So glad you are feeling better, what a nice surprise visit. Did you get the text pictures?